Here is the previously untold story of Captain Janeway's crew. They began as individuals, following very different pathways, but together, under the leadership of one remarkable woman, they have become one of the finest teams in the known universe - the crew of the Voyager. Read by Robert Picardo! 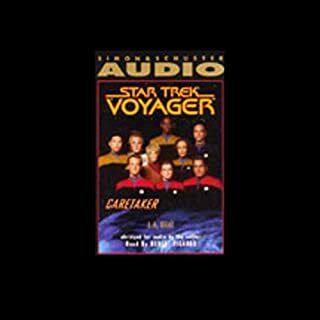 Here is the novelization of the premiere episode of Star Trek, Voyager, the unprecedented fourth television series based on Gene Roddenberry's vision of the future. It is the story of the crew of the Starship Voyager, who are hurled far across the galaxy and must team up with their most dangerous adversaries to return home. Read by Robert Picardo, and enhanced with sound effects and an original score! Years before they became crewmates on the U.S.S. Enterprise, Commander William Riker and ship's counsellor Deanna Troi had a tempestuous love affair on her home planet of Betazed. Now, as their passions have cooled, the two serve together as close friends. Yet the memories of what passed between them linger and Riker and Troi remain Imzadi, a powerful Betazoid term that describes the enduring bond they still share. Legends never die....Old friends are reunited and ancient secrets revealed as Kirk, Spock, Picard, Riker, Data, and all of the Federation's best and brightest are enmeshed in a cosmic saga that will test their strengths and loyalties to the very limit. 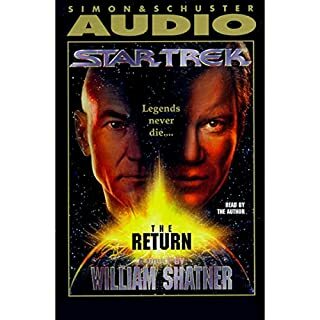 A personal tale of tragedy and triumph that could only have been written - and read - by William Shatner! One hundred years ago, 4 crewmembers of the U.S.S. Enterprise™ crossed the dimensional barrier and found a mirror image of their own universe, populated by nightmare duplicates of their shipmates. Barely able to escape with their lives, they returned, thankful that the accident which had brought them there could not be duplicated...or so they thought. But now the scientists of that empire have found a doorway into our universe. Their plan is to destroy from within, to replace a Federation Starship with one of their own. More Unabridged Star Trek TNG! A strange device from the Gamma Quadrant has shifted Quark and Odo three days into the future to a silent Deep Space Nine littered with the bodies of their fallen crewmates. To save the station they must discover what caused an invasion by heavily armed alien warriors - and find a pathway back through time itself. Read by René Auberjonois! I, Q is a wild and witty voyage through the secret soul of creation as only the enigmatic Q can tell it! Co-written and read by John de Lancie, who portrayed Q on television for more than a decade! Audie Award, Narration by Author, 2016. 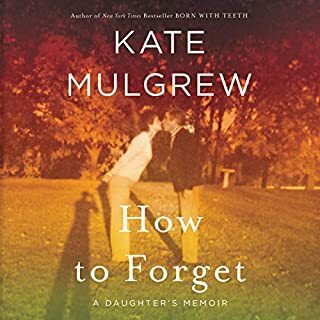 Raised by unconventional Irish Catholics who knew "how to drink, how to dance, how to talk, and how to stir up the devil", Kate Mulgrew grew up with poetry and drama in her bones. But in her mother, a would-be artist burdened by the endless arrival of new babies, young Kate saw the consequences of a dream deferred. Before he commanded the Starship Enterprise, Jean-Luc Picard was the captain of the deep space exploration vessel, the U.S.S. Stargazer, on an incredible twenty-two year voyage. Now Picard is reunited with his old crew for the first time in over a decade, on a mission to see his former first officer installed as ruler of the Daa'Vit Empire. With the Federation losing ground in its war against the Dominion, the galaxy's greatest smugglers, including the beautiful and enigmatic Vash, rendezvous on Deep Space 9. Their objective: a fabled lost orb of the Prophets unlike any other, rumored to be the key to unlocking a second wormhole in Bajoran Space, a second Celestial Temple. Imzadi ll is a compelling untold chapter in the history of the U.S.S. Enterprise. 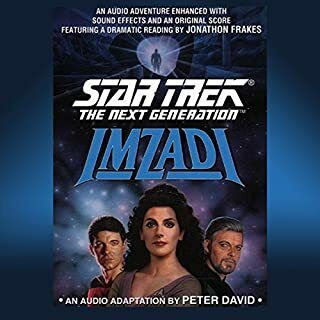 The special bond between Troi and Commander Riker was explored in Peter David's earlier novel, Imzadi. Now, he examines the heart of Deanna Troi from an altogether different perspective, as he reveals for the first time the full story of Troi's troubled romance with Lieutenant Commander Worf. 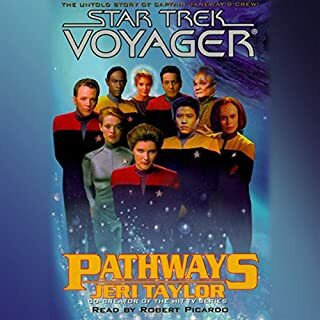 Captain Kathryn Janeway, commander of the Starship Voyager, is fighting a desperate battle on two fronts: while she duels the Kazon warship in the gaseous mists of a murky nebula, an Away Team led by Lt. Tuvok is trapped on the surface of a wilderness planet. 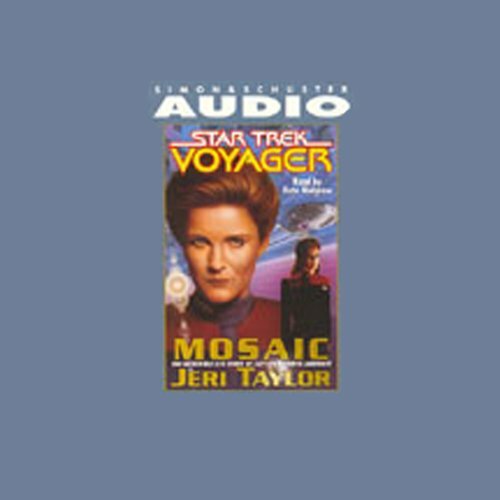 Forced to choose between the lives of the Away Team and the safety of her ship, Captain Janeway reviews the most important moments of her life, and the pivotal choices that made her the woman she is today. From her childhood to Starfleet Academy, from her first love to her first command, she must once again face the challenges and conflicts that have brought her to the point where she must now risk everything to put one more piece in the mossaic that is Kathryn Janeway. I love that Kate Mulgrew narrated this book. It adds so much depth to the reading. The story was enjoyable and I always wanted to hear more. I have to admit that Voyager wasn't my favorite Star Trek and Janeway wasn't even my favorite Captain. But maybe I've made a mistake. I found this story engaging and engrossing. I cared about all the characters and I dearly wish that it had been longer. I have no doubt I will re-listen to this book and I will buy more books narrated by Kate. She has a natural style that was very appealing. It's also obvious that she cares about the material in the loving way she gives passion to her reading. Bravo Kate, and thank you. Best Star Trek book I've heard yet! Only Kate Mulgrew could have done this book justice. 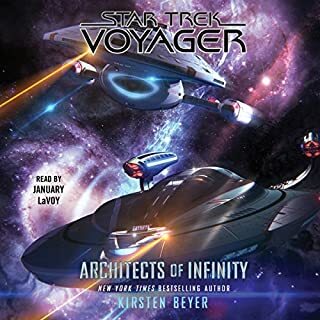 She IS Captain Janeway, as surely as William Shatner IS Captain Kirk... Everything about her narration of this story was delightful: pacing, inflections, and emotion were all spot on. The story itself has three main threads running through it: milestones and character shaping events in Janeway's life, Tuvok and an away team stranded on a planet, and Voyager battling with the Kazon over said planet. I most enjoyed the bits about Janeway's life. Kate Mulgrew really brings the young Katherine to life - you feel like you are there with her in her early life. The threads involving Tuvok, Kes, Harry, etc seemed to suffer somewhat from abridgement. Overall I wasn't terrifically interested in the these two other threads. There is one point where some Kazon meet a very gruesome end that I thought was unnecessarily grotesque and overdone. Fortunately this portion is brief. Overall, a most excellent and enjoyable listen. I really felt that the Janeway portions added a great deal of dimension to the character. I gave this only three stars not because of the story but because of the abridgment. Story is great and you learn much about Janeway. I just really dislike abridgments, I wish all the Star Trek book were not like this. To say that this Star Trek story was merely good would be an understatement. It is one of the best stories to be written by Jeri Taylor. This Novel provides a look into the soul of Captain Janeway. I for one found this book engaging and poignant. A good audio book if I ever heard one. Kate Mulgrew’s narration is perfection. She IS Captain Janeway! The story is interesting. I love learning Capt Janeway’s back-story that we never learn in Voyager, but answers a lot of questions about where she came from and how she got there. The sound effects in the story are a bit corny and make the recording sound a bit dated...but to be fair it *is* dated since it was recorded back in 1996. Just know that it sounds like the 90’s. Other than that - it’s perfection. Loved this book,. Still miss Voyager after all these years. Brought back fond memories of the show. I'm a big Star Trek fan, and Voyager has only added to it. Kate Mulgrew as Captain Janeway sealed the deal - and LOVED hearing her narrate this. Maybe I'm a bit of a baby, but there were several parts of this story that brought tears to my eyes. Kate Mulgrew was fantastic in her narration of this wonderful story!! It fills in Janeway's backstory nicely!! If you're a Voyager fan I 100% recommend listening to this. You get insight into Janeway's history and also Kate Mulgrew reads very well. Fans of Voyager will love this. Fans of Janeway will ADORE it. Stellar performance by Kate Mulgrew, however the sound effects are sometimes distracting and too loud. Nevertheless, the story is intriguing and well written. Whilst Kate Mulgrew gives a very good performance of the characters. The actual story let it down for me, the plot line seemed to jump from one theme to another. One minute Janeway is the captain we all know and admire, the next she is a child laid in a field in the rain crying. then she is an adult again, then she is back on the bridge of Voyager, then she is a child again etc etc. Very annoying to be honest. I found myself glad when the story was finished.